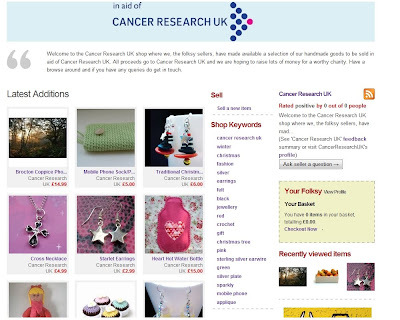 The Cancer Research UK Folksy shop is now live! Thank you to everyone who has already sent their item donation details through and I'm looking forward to listing the rest when they arrive over the next few weeks! There is no deadline for submissions and it would be great to keep the shop stocked until Christmas so please keep sending your donations! Christmas shopping? Check us out for gorgeous handmade gifts!